Google, in addition to announcing a redesign of its Image Search on Tuesday, also launched a new ad format called Image Search Ads. The ads, which appear only on Google Images, allow advertisers to include a thumbnail image beside the traditional (and boring) lines of text. 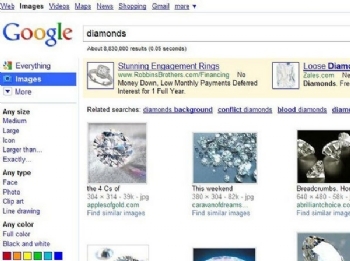 Say, for instance, a Google Image user does a keyword search for “diamonds.” In the example below, the ads that appear on the results page show a thumbnail image of a diamond. 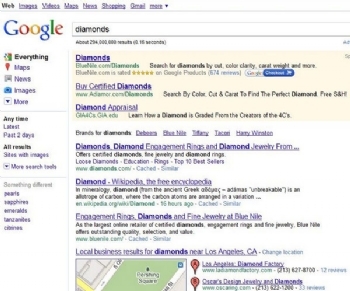 Contrast that with a “diamonds” search in Google Web Search. The ads up top are text-only. For a business that advertises online, Google Image Search Ads are a positive development. They allow you to target users who are expressly searching for images. Consumers–well, human beings in general– respond better to images than to words, and a standard, text-only Google AdWords ad is far too easy to ignore. The addition of a single image is likely to lure more eyeballs to your ad. Image ads will likely prove more effective for some searches (“flowers”) than for others (“colonoscopy”). And it’s highly likely that Google will expand Image Search Ads to its other services as well. Businesses may find that image ads are a cost-effective way to reach new customers. Image Search Ads appear only on Google Images, and they’re priced as a standard AdWords ad, the company says. Advertisers can use Google’s Display Ad Builder template to match ad text with a relevant image. The AdWords Help Center has more details.